The Helen Woodward Surf Dog Surf-A-Thon Dog Surfing Competition is held in September at Del Mar Dog Beach in Del Mar, CA. They offer surfing and SUP lessons throughout the summer so you can teach your dog to surf. Lessons include personalized instruction, volunteers to help you retrieve your dog and board, use of a surfboard and canine life vest. Heats include small, medium, large and extra-large dogs. Contestants participate in 10 minute heats based on weight class and are judged on length of ride, size of wave ridden, catching a critical part of the wave (swell area—green part before it breaks and becomes white), maneuvers (walking on the board, turns on the wave, hanging 20, kick outs, barking...always a plus!). Extra points are awarded for dogs who stand on the board (not sitting or lying down) and have a confident attitude, and are wave ready! First place winners from each weight class will move on to the finals—Best in Surf, Surf dog competition. Proceeds from this event go directly to the pets and programs at Helen Woodward Animal Center. 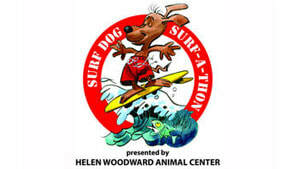 For complete details go to the Surf Dog Surf-A-Thon website. 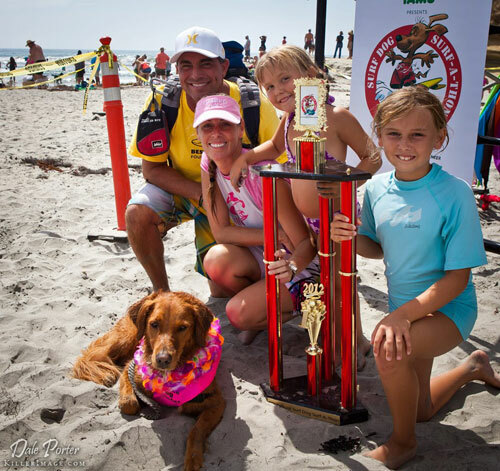 ​Ricochet won several of the Surf Dog Surf a Thon Dog Surfing Competitions. But, more importantly, she was the highest fundraiser for four years in a row! Each year she raised more than the year before. These efforts saved the lives of homeless animals. Entered when she was 7 months old, but didn't win!